Are almonds safe to eat? (And the question is relevant for the now almost ubiquitous almond milk and almond butter too.) Unfortunately, it seems that the answer is mostly no. It’s a question that is important to me because now that winter is here, I am making more than ever my batches of dehydrated crackers. Since I gave up eating wheat (after reading Sayer Ji’s monograph The Dark Side of Wheat), my dehydrated crackers serve as a nice substitute for bread. My favorite recipe is for my Rosemary Crackers, for which I use sprouted flaxseeds and sprouted almonds. It is important to sprout raw nuts and seeds by soaking them first. Nature’s defense mechanisms include nutritional inhibitors and toxic substances: enzyme inhibitors, phytates (phytic acid), polyphenols (also known as tannins), and goitrogens. All these are removed automatically by nature when it rains—the nut or seed gets wet and can then germinate to produce a plant. When we soak our nuts and seeds, we are mimicking nature. My crackers are delicious, but also extremely healthy. The main ingredients—flaxseeds, almonds and rosemary—are well known to confer many health benefits, including reducing risk of heart disease, cancer, stroke, and diabetes. Flaxseeds are an important part of the Johanna Budwig cancer protocol. The late cancer specialist, Mitch Gaynor, M.D. (a friend and colleague) considered rosemary to be the number one anti-carcinogenic spice, as he stated in all of his speeches. The almonds are, too, an important part of the powerhouse health delivery of the crackers. Just a small handful of almonds provides heart-healthy monounsaturated fat, protein, fiber, potassium, magnesium and iron. Almonds are, as well, the best nut source of Vitamin E.
U.S. grown almonds comprise 80% of the world’s supply. Of these, most come from California. In 2001 and 2004, 33 people fell ill from salmonella outbreaks from almonds (none died). As a response, in 2007, the state of California’s Almond Board, in conjunction with the U.S. Department of Agriculture, proposed an industry-wide “mandatory sterilization” rule for almonds, even those grown organically. The Almond Board declared various methods of pasteurization to be adequate: oil roasting, dry roasting, blanching, steam processing, irradiation, and, rather mystifyingly, the use of propylene oxide (PPO). There are problems with each of those processes: the first three cook the almonds, causing a reduction of nutrient content. Steaming them, at first blush, sounds like the most innocuous. But, it’s not. In this process, the almonds are exposed to steam for 8 seconds at 210-215 degrees F. For the next 44 seconds, they are moved through a high-heat dehydration tunnel, removing the moisture resulting from the steam. The temperature of the circulating air is 391- 395 degrees F. The almonds themselves reach the temperature of 220 degrees F.
Heating, or pasteurizing, almonds has many deleterious effects. Flavonoids found in their skin are reduced. The reduction of over twenty potent antioxidants is estimated at between 30%-70%. Enzymes are destroyed, vitamin content is diminished, proteins are denatured, beneficial bacteria are killed, and the growth of pathogens is encouraged. As well, heat oxidizes the omega-3 fatty acids in almonds, potentially turning them rotten and creating free radicals that are suspected of playing a role in the development of a host of degenerative medical problems, including cancer. Studies also show that heating almonds creates potentially harmful levels of acrylamide, a byproduct of the amino acid asparagine. Acrylamide is a chemical known to cause cancer, and/or reproductive toxicity leading to birth defects and other manifestations of reproductive harm. In spite of these adverse results of steaming almonds, the last permissible method of processing almonds is even worse than pasteurization. Propylene Oxide (PPO) is a surface treatment, approved for use on foods since 1958. It is widely used for a variety of foods such as other nuts, cocoa powder and spices. PPO is an extremely volatile liquid, previously utilized as a racing fuel, but now banned by motorcycle and car racing associations as being too dangerous. It is still used in the making of polyurethane plastics as well as fuel-air bombs. Given the choice of treating their almonds with steam or PPO, non-organic farmers are invariably choosing PPO, as cost has become a significant factor. Steam treatments costs are $2.5 million a year whereas PPO costs are only $500,000. Close to 70 percent of almonds grown in the US are treated with PPO. Most health food stores claim to sell raw almonds. They can make that claim because there is no labeling requirement. 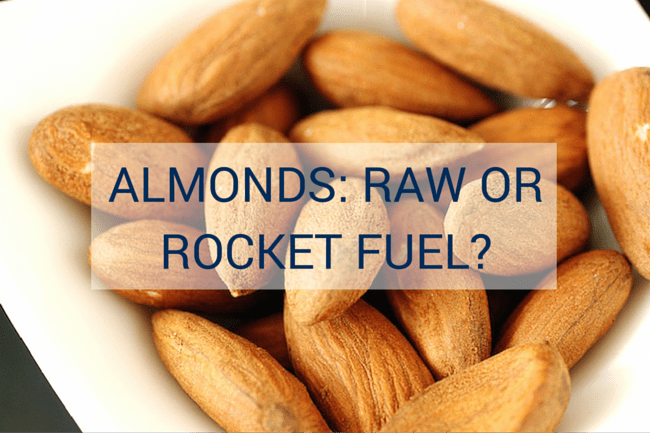 You can’t know if the “raw” almonds have been steamed, or treated with a known carcinogen. If the almonds are U.S. grown, in all likelihood, one or the other of those methods will have been used. Both Whole Foods 365 brand and Trader Joe’s almonds are steam-treated. Blue Diamond sliced and slivered almonds are steam-pasteurized, and its whole-nut “natural” line is treated with PPO. Superior Nut non-organic almonds are fumigated with PPO, but their organic sold in bulk at the company’s website is not fumigated. Almond milk has recently become popular as a beverage. It has become almost ubiquitous as the base for smoothies. There are various reasons, additional to all the reasons already stated, why commercially sold almond milk is an unhealthy drink. It contains fillers, and often the filler used is soy lecithin. Soy contains equol and genistein; these are isoflavones that affect the production of thyroid hormones. As well, most soy used in the U.S. today is a GMO version of the crop. Another commonly used thickener is carrageenan. Because carrageenan is obtained from red algae, it is tempting to think of it as a healthy natural product. However, it has side effects that include digestive distress, diarrhea and fatigue. Almond milk is not naturally sweet, and is made sweet by adding the best of the choices, cane juice, but more often high fructose corn syrup, or even worse, toxic sugar substitutes like sucralose, aspartame or acesultame. Finally, it is also likely that the almonds used to make most commercially sold almond milks are PPO fumigated. Health food stores can avoid the steam/PPO quagmire by selling Spanish or Italian imported almonds. To date, it is not required that imported almonds be irradiated. However, the tide may be turning in favor of large-scale irradiation for imported foods. In 2003, the Codex Alimentarius General Standard for Irradiated Foods was implemented, stating that there is no upper dose limit on irradiating foods. Irradiation is federally mandated for imported foods. Regulations that dictate how food is irradiated, as well as which foods are allowed to be irradiated, vary greatly from country to country. In Austria, Germany, and many other countries of the European Union only dried herbs, spices, and seasonings can be processed with irradiation and only at a specific dose. In the U.S., beef, pork, lamb, poultry, fruits, vegetables, wheat, wheat flour, eggs in the shell, herbs, spices, dried vegetable seasonings are irradiated. Nuts—as well as dried legumes, coffee and honey—are still on the exemption list. The radioactive level that is currently allowed in the U.S. for foods on the “yes” list is higher than any other country, and is exponentially higher than the level of the radiation hormesis that confers benefits. Meat, for instance, is irradiated with a dose that is 15 million times higher than the radiation amount of a chest x-ray, or 150 times higher than the dose that will kill a human being. Imported food is no longer radioactive by the time you are eating it; nevertheless, when the food is a form of produce, after irradiation, it is no longer a living product. Irradiated foods can no longer reproduce. Once the reproductive system of any entity—animal or plant—has been removed, the life vitality is lost. Thankfully, there is one exemption to the law mandating that all U.S. grown almonds be treated, and therein lies the aforementioned “secret.” The sole exception is if the farmer has a ROADSIDE STAND. I found one California nut farmer who, indeed, has a roadside stand, and is able to ship out almonds (and other nuts) that are truly raw and organic– Bremner Farms. According to federal regulations, these farmers are limited to shipping 100 lbs. a day to any individual–quite enough for most anyone’s needs. Either Celtic or Himalayan salt to taste. This entry was posted in Alternative Medicine, E Patient Health Care, Introducing, Lifestyle Health, Longevity, Medical Studies, Nutritional Blends, Tele-Medicine and tagged About Almonds:, acrylamide, almond milk, almonds, cancer, Codex Alimentarius, diabetes, E-Patient Health Care, flavonoids, food irradiation, heart disease, high fructose corn syrup, radioactive level, Raw or Rocket Fuel?, rosemary, sprouted flaxseeds, stroke, Take Your Pick, The Hormesis Effect by Admin. Bookmark the permalink.